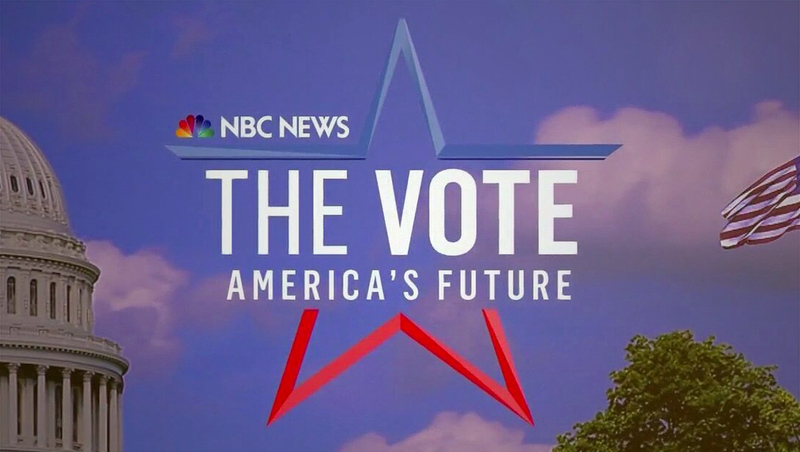 With interest in the 2018 midterm elections approaching that of a presidential election year, all of the major U.S. networks featured special venues and graphics to cover the big night. 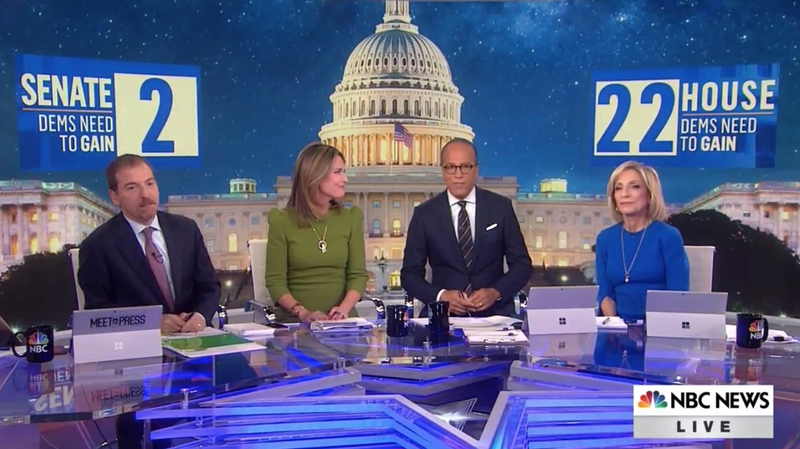 NBC’s broadcast network coverage originated from Studio 1A, normally home of the ‘Today.’ Instead of using imagery of ‘Democracy Plaza,’ as it has in the past, however, the network opted for a sprawling stylized image of the Capitol. Like during earlier uses of the ‘Election Center,’ the network added data visualizations to either side of the video wall and also added temporary scenic elements in place of the ‘Today’ logos on the walls and logo sculpture to the left. 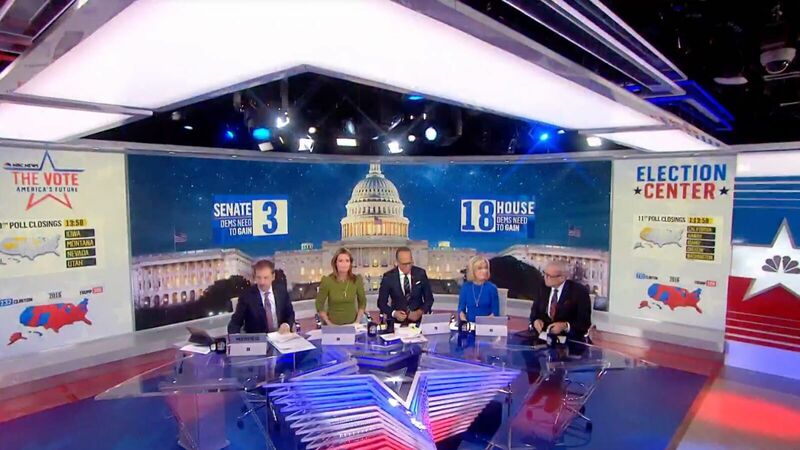 The network reused the star-shaped anchor desk it has used for a variety of political coverage in the past. 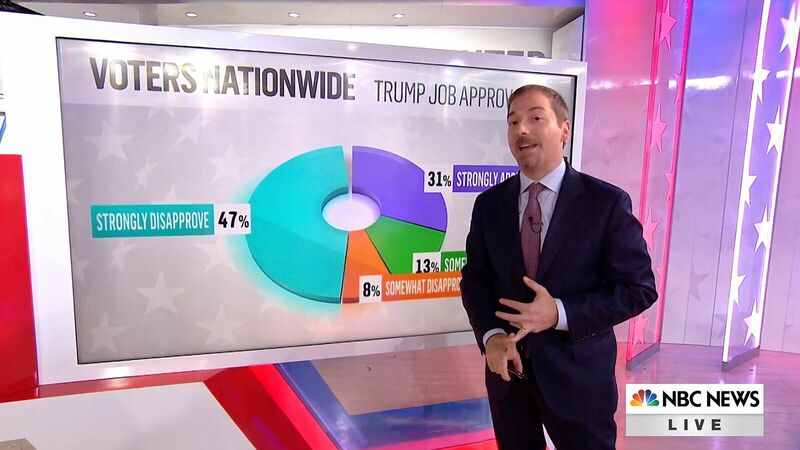 Meanwhile, NBC also kept two key numbers on the video wall behind its anchors throughout the evening. 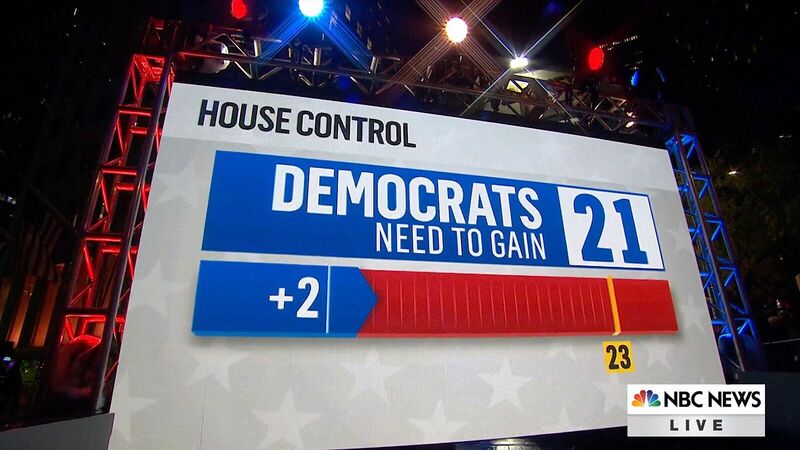 The numbers needed for democratic control of the senate and house were placed above the left and right side of the Capitol image on the background, respectively. When republican control of the senate was assured, the blue rectangle on he left become red. 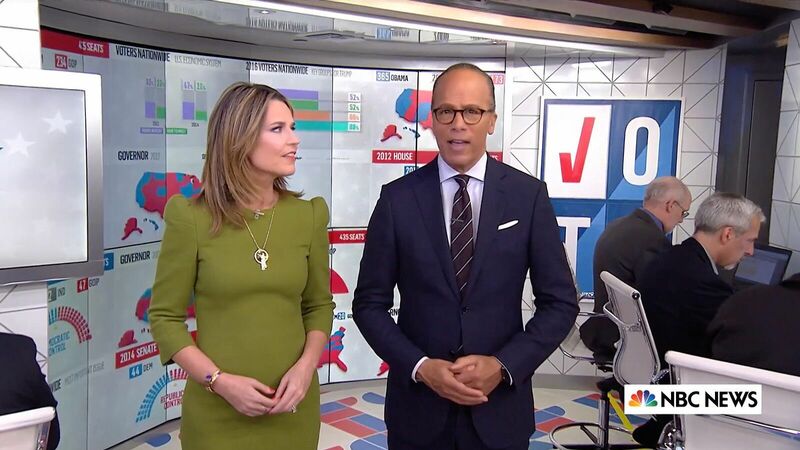 NBC also turned ‘Today’s’ Orange Room into, well, the red, white and blue room for election coverage. The area was redressed with triangular paneling, with its curved video wall used to display data. The floor was covered with a bold, fun geometric pattern. The space was also used for on-camera workstations. 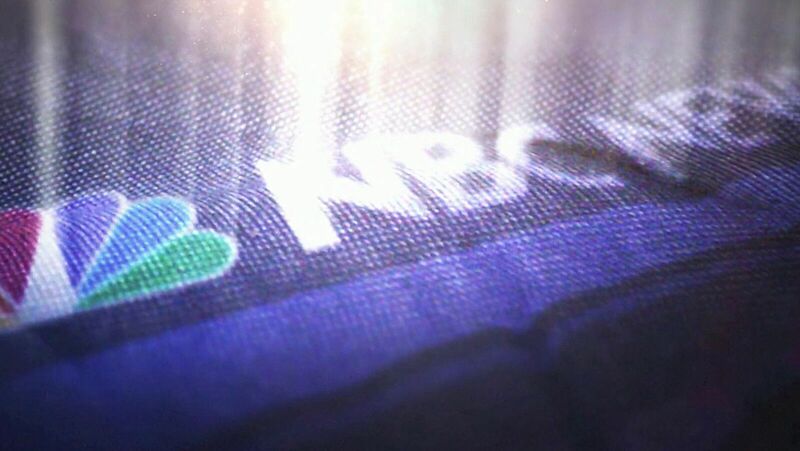 In front of the Orange Room space NBC added an additional touchscreen with a red, white and blue support structure. This position also showcased the starred glass panels installed in place of the ‘Today’ logo sculpture. 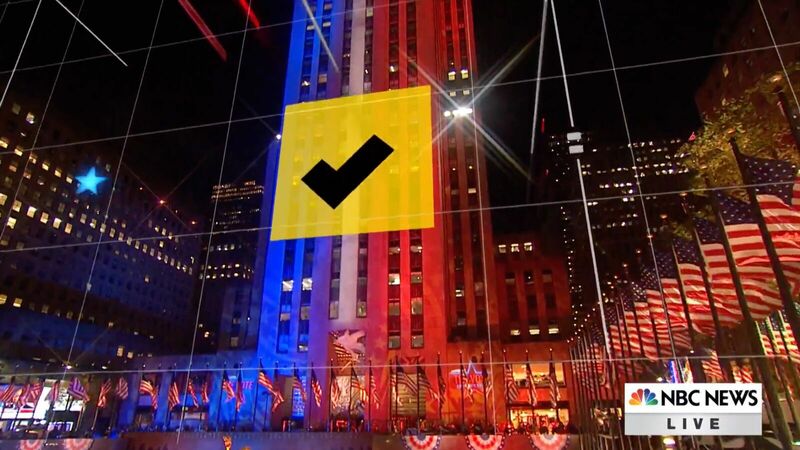 Like in 2016, NBC also inserted augmented reality graphics over the Rockefeller Plaza ice skating rink and 30 Rock tower. These graphics were used to display race projections, ‘too close to call,’ maps and graphs. NBC worked with Girraphic to design the augmented reality graphics, Stype for camera tracking and Vizrt’s AR rendering software. A non-augmented outdoor setup featured a temporary LED video panel set up outside of Studio 1A, which was used to showcase graphs and charts — as well as branding — throughout the night. NBC also used an updated open that began with shafts of light shining up from a highly textural fabric pattern featuring logo sand imagery. The Capitol was then used prominently for the final title card.